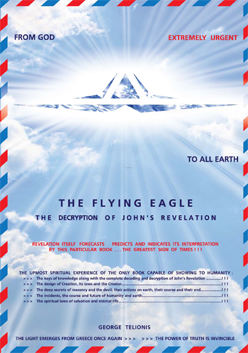 The website and book prophesied in John's Revelation ! ! ! a priceless gift of light and knowledge from Greece to modern humanity. of the entire John's Revelation. predicts, prophesizes and indicates in a miraculous way. Click here or on the image (PDF 18Mb)"
ancient and new prophecies of Saints. 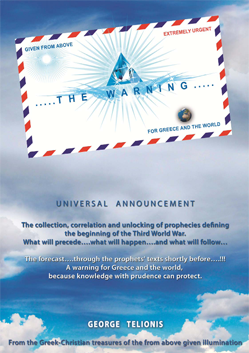 The prophecies of Saint Tarasius and General Makrigiannis are decoded and unlocked here for the first time indicating to us the year 2012-2013. Click here or on the image (PDF 1Mb)"
To open and view the book you need to download Adobe Reader software. Download it free by clicking on the icon on the right. The download of the book from our website is free. Anyone can contribute by making a donation. Any donation is valuable to the continuation of our goal.. Copyright © 2012 --------------- GEORGE TELIONIS --------------- All Rights Reserved.